Trilobites form one of the earliest known groups of arthropods.They were the first animals with an exoskeleton, so were easily fossilized. 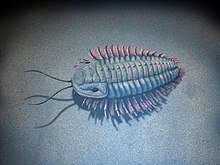 Trilobites lived in Earth's ancient seas for over 270 million years (a successful animal! ), and died out 252 million years ago (before dinosaurs existed). They resembled the contemporary horse-shoe crab. 1. a cephalon with eyes, mouth parts, and sensory organs such as antennae.